Bolstered by a script ranking number three on the 2010 Brit List—a film industry tabulation of the best unproduced British screenplays—Eran Creevy‘s Welcome to the Punch goes a long way to putting the writer/director on our cinematic map. The guy has worked behind the scenes on projects with Danny Boyle, Woody Allen, Neil Jordan and Matthew Vaughn, the latter appearing to be who’s style he most closely resembles. Shooting a ton of music videos and commercials alongside his debut feature Shifty, Creevy has cultivated a brilliant visual aesthetic that unsurprisingly caught the attention of talent finder Ridley Scott, who produces here. With that sort of clout behind him it’s no wonder he secured such an impressive cast for his sophomore effort—one potentially poised to make him a star like Layer Cake did Vaughn. With help from the gorgeous glass buildings and lights of London’s 2012 Olympics-led rejuvenated East End, Punch‘s opening is a stunning cat-and-mouse chase through carefully-scouted locations during a deserted, late evening heist. 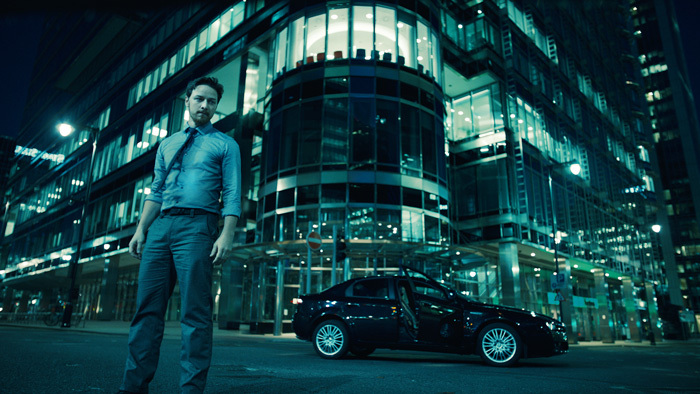 Fresh-faced and idealistic, Detective Max Lewinsky (James McAvoy) has tracked down the elusive criminal Jacob Sternwood (Mark Strong) on his getaway from a score large enough to retire with. Knowing in his gut the only chance of an arrest is going in alone, Max puts the pedal to the floor and tails Sternwood’s motorcycling crew to cut them off inside their underground tunnel stretch towards freedom. Keenly anticipating every move, he meets his adversary in a quick burst of violence ended by a singular gunshot. As Lewinsky lay in pain with a bullet in his knee, Sternwood vanishes. Fast-forward three years and we see Max saddled by the necessity to drain his knee with a syringe, hobbled in gait and mental drive after being blamed for failing to apprehend his man that fateful night. Now partnered with the equally headstrong Sarah Hawks (Andrea Riseborough), Max must answer to the guy who received his promotion, Nathan Bartnick (Daniel Mays). Only the current police chief Thomas Geiger (David Morrissey) still sees his worth, but a bid for re-election has kept him away too long to prevent the now hardened cop from becoming completely disenfranchised. And with Lewinsky’s present case against Dean Warns (Johnny Harris) about to be thrown out the window due to a laughable alibi putting the accused killer at home with his grandmother watching Calamity Jane, nothing seems worth the effort anymore. Only a kid with a gunshot wound at the airport can shake Max’s indifference. Revealed to be Ruan Sternwood (Elyes Gabel) — Jacob’s son — the disappeared thief is all of a sudden back on everyone’s mind. Here’s the perfect opportunity to smoke him out of hiding as an ill-advised phone call by the boy points directly to dad’s Icelandic retreat. Lewinsky knows they need to set a trap and not go in guns a-blazing like Nathan orders, but it’s no longer his call. Caught with a newfound vitality, Max and Sarah talk Geiger into giving them security detail with Ruan and the journey to solve the puzzle facing them begins. As they get closer to an answer, however, an unseen web of deceit unwinds to turn the simple bait-and-capture into a massive conspiracy bigger than any one man. Creevy infuses his suspense thriller with polished chase scenes, explosive hotel room and nite club shoot ’em ups, and even a bit of humor a la Vaughn’s own steward Guy Ritchie. Rather than go the easy route to make it a simple case of good guy versus bad, Punch finds itself blurring the distinction to expand on man’s code of honor at a time of war. Questions like why Sternwood didn’t just kill Lewinsky three years previously burn as new mysteries are revealed to put these archrivals onto a similar path. At a certain point it becomes less about the job and more about right and wrong. Whether Sternwood deserves prison or not, the corruption that placed his son in the hospital must trump everything else—especially if it also led to Lewinsky being hung out to dry. With a perfect mix of new and old on the British acting front, the film becomes a great place to introduce American audiences to someone like Riseborough (before she starts in the high profile Oblivion) and showcase guys like Morrissey and Mays alongside the more familiar McAvoy and Strong. These supporting players, along with Peter Mullan as Sternwood’s associate Roy Edwards and Dannielle Brent as political publicist Karen Edwards, bolster the central performances to flesh out the deeper motives at work and make the story’s scope wider than merely a drive for vengeance. Lewinsky and Sternwood unwittingly get caught in bigger picture intrigue and frankly are at their best when forced to put aside their differences in order to survive. 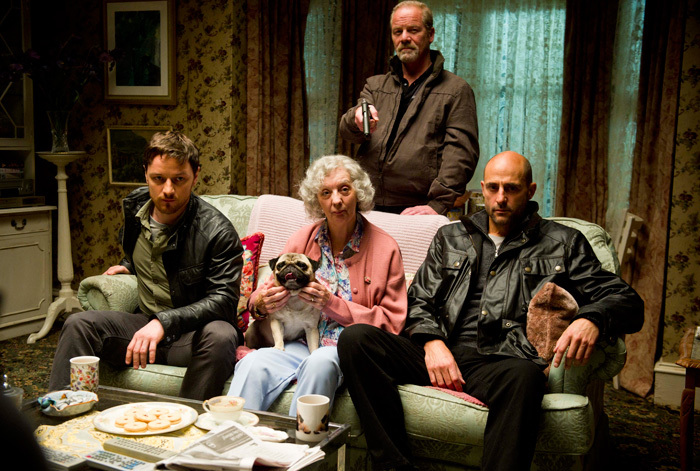 As such, a scene with McAvoy, Strong, Mullan and Harris hashing things out with the latter’s grandmother is a treat. There have been a lot of flashy actioners released in the past couple decades that in some regards render Welcome to the Punch redundant in as far as its plot twists and allegiance changes may be concerned. Who hasn’t become used to genre flicks fitting a predetermined formula, though? With less room to truly be unique, the efficacy of the project comes from a combination of all its technical success and ability to entertain. I can’t say I was ever unimpressed by the pacing, visuals, or acting throughout, instead finding myself drawn into the natural progression of things that brought enemies together and criminal deeds full circle. 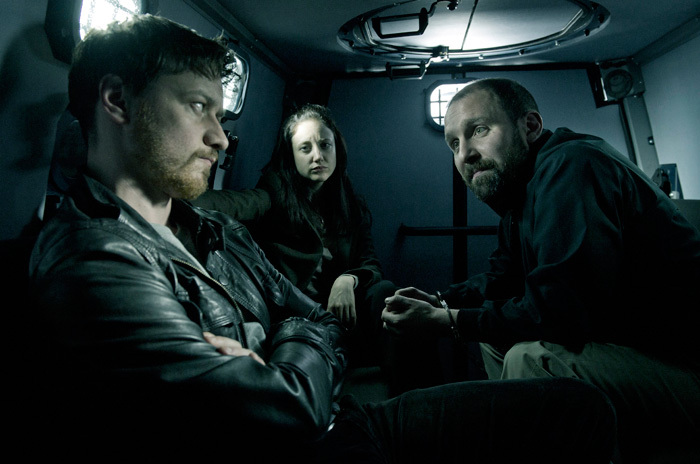 Having two stellar performers like McAvoy and Strong take the time to add a bit of dramatic excellence to the cause only helps in securing its success. 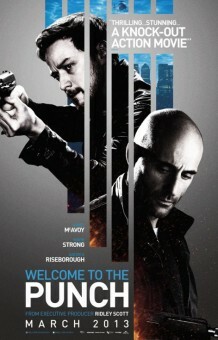 Welcome to the Punch opens in limited release on March 27th and hits VOD March 30th.